Orange OB1-500 Bass Amp Head It's fairly common these days to see a bassplayer "dual-amping" with both a bass and guitar amp in an attempt a.. It's fairly common these days to see a bassplayer "dual-amping" with both a bass and guitar amp in an attempt at thrashing out that perfect blend of harmonics and overdrive to achieve to perfect tone. 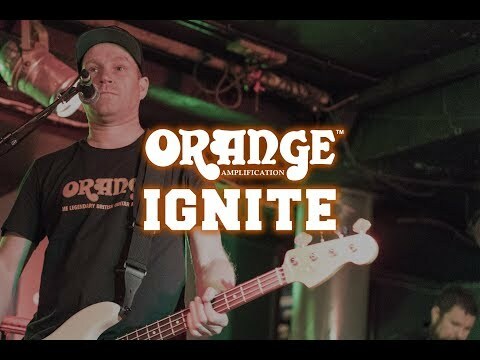 Orange have now made that particular practice unnecessary thanks to the portable and stylish OB1 series of class A/B rack mountable bass heads. The unique sound of the OB1-500 comes from the footswitchable Blend circuit, which boosts the upper registers of your input signal with just a touch of gain and plenty more harmonic content. Your lower frequencies and clean signal on the other hand are left completely alone, ringing out clearly just as you'd get from the afore-mentioned "bi-amped" setup. Through experimental use of the amp's Gain and Blend controls the world can literally be your oyster, giving you options of tone ranging from a nice clean boost, to an all out dirt-fest, and everything in between. The OB1-500 shares the same layout and 2U rack dimensions as the less powerful OB1-300, as well as a full fat 500 Watt output section to really get the air moving. As mentioned earlier, the OB1-500 works with the same characteristics as utilising both a bass and guitar amp simultaneously. This is achieved by splitting the input signal into two separate and distinct paths: one for a pure, unaltered and clear bass signal; the other mixing in programmable levels of gain into your signal's upper harmonic register. Make effective use of the Blend control knob to determine just how much clean and dirty signal is in the final output and then remotely engage/disengage the blend control via the optional footswitch. The all analogue signal path of the OB1-500 is evidence of Orange's commitment to continual use of analog circuitry, making sure that even the most affordable of models can produce that trademark Orange sound that we all know to expect when we see their famous logo adorning a speaker. The 3-band EQ section on the amp is the perfect finishing touch, with the whole package inspiring musicians to play their instrument and not their effects. The OB1-500 is home to an active three-band EQ system that's been painstakingly crafted to be highly responsive, giving you the maximum possible effect with the least amount of fuss. The controls give you up to +/-15dB of boost or cut to the Bass and Mid registers of your signal, and up to +/- 20dB boost or cut to your top end. Nice! The OB1 Series of amps mark the first of many Orange Rack-Mountable amplifier heads, being suitable for 19" cases. The rugged coated steel chassis and fascia make this really look the part in any live and studio rack setup. The OB1 Series seem to be the answer to many bass players prayers: it's hard-wearing, stylish, portable, and most of all rather affordable in comparison to other amps of this calibre. If you'd like more information or an in-store demonstration, contact your local PMT Store and speak to one of our ever-helpful product experts. Order this awesome amp online before 3pm today and qualify for our fast, free and reliable next day delivery service! If you have any queries relating to delivery or our range of finance options, be sure to contact our sales team directly.